https://matcha-jp.com/en/2609 Hiroshima Area Guide - All You Need To Know Before You Go! From the Genbaku Dome and the Hiroshima Peace Memorial Park, to Hiroshima Castle and Miyajima, Hiroshima truly is a city overflowing with historical structures. Beyond the historical structures you can also find places like Shukukeien, a classical Japanese-style garden which is located a short distance from Hiroshima Station, the Genbaku Dome (or A-Bomb Dome), the symbol of Hiroshima and Hiroshima Castle, which was restored in the Edo era, as well as the popular shopping areas Kamiyacho and Hacchobori - Hiroshima is a city with everything a visitor could want. Not only famous for its sightseeing attractions, Hiroshima is also where you will find Hiroshima-style okonomiyaki, momiji manju and other delicious foods. Here we have compiled our very own guide to seeing all that there is to enjoy in Hiroshima. Whether traveling from Tokyo or Osaka, Hiroshima can easily be reached via bullet train, plane, highway bus or by rental car. When traveling from Tokyo to Hiroshima, these routes are the most convenient. - By shinkansen (bullet train): takes 4 hours; regular 1-way reserved seat ticket costs 19,080 yen. - By plane: takes 1.5 hours; regular 1-way ticket costs from 7500 yen to 30,000 yen. If you would like to know more about other routes or more details about these routes, please read the following article. When traveling from Osaka to Hiroshima, these routes are the most convenient. - By shinkansen: takes 1.5 hours; regular 1-way reserved seat ticket costs 19,040 yen. - By highway bus: takes 5-8 hours; costs from 3850 yen to 5850 yen. The area around Hiroshima Station is where you will find two notable sightseeing spots: Shukukeien and the Hiroshima Prefectural Museum of Art. Shukukeien is a classical Japanese style garden that was first formed about 400 years ago. It is a beautiful garden well-known for its incredible seasonal colors, especially the cherry, plum and peach blossoms in spring and the amazing fall leaves in autumn. The Hiroshima Prefectural Museum of Art is an art gallery adjoining Shukukeien. Here you will find everything from fine arts with a connection to Hiroshima to works by both domestic and international artists; there are approximately 5000 works in their collection and the museum holds special exhibitions each season. The symbol of Hiroshima, the Genbaku Dome and the Hiroshima Peace Memorial Park can easily be reached from Hiroshima Station on the streetcar. From Hiroshima Station if you take the Hiroshima Railway (Hiroden) traveling to either Miyajimaguchi (宮島口) or Eba (江波) and get off at the Genbaku Domu-mae (原爆ドーム前) stop, you will find the Dome standing right before your eyes. The fare for the streetcar is 150 yen. The Genbaku Dome is the name for the miraculous remains of a structure that was almost completely destroyed by the atomic bomb dropped on Hiroshima 70 years ago; it has been designated a World Cultural Heritage Site by UNESCO. If you walk for 5 minutes from the Genbaku Dome, you will come to the Hiroshima Peace Memorial Park, a park dedicated to prayers for permanent world peace. 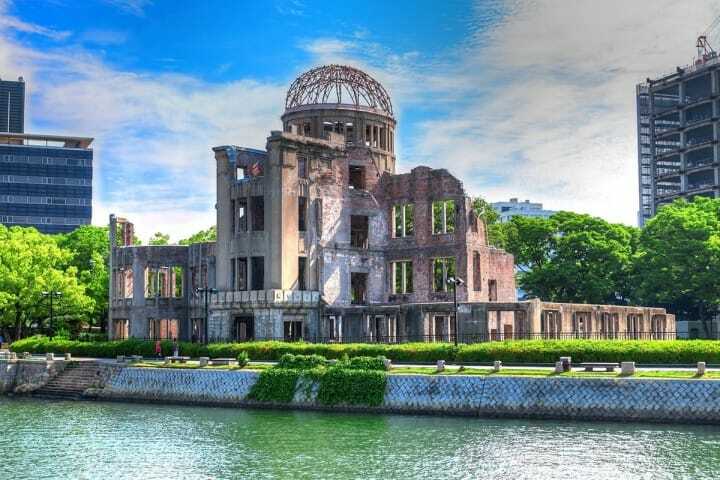 Within the park you will find the Hiroshima Peace Memorial Museum, where you can see images and artifacts from Hiroshima before and after the atomic bomb was dropped, as well as the cenotaph dedicated to the memory of those that lost their lives in this attack. Conveniently located near Hiroshima Station, Hiroshima Castle is a must-see spot during any trip to the city. Hiroshima Castle is counted as one of Japan's 100 most famous castles. Destroyed when the atomic bomb was dropped on the city, it was soon after restored to its Edo-era glory. Kamiyacho and Hacchobori make up the central business district of Hiroshima. The Hiroshima branch of the Sogo department store, Motomachi Kuredo, Kamiyacho Shareo and other stores make for a thriving shopping area. Hondori Shotengai, Nakanotana Shotengai, Ginzagai Shotengai and other shopping streets are overflowing with shops selling various wares - this is a spot not to be missed! There are also plenty of cafes and restaurants to choose from here too. If you'd like to enjoy some great food and go shopping, head to Kamiyacho and Hacchobori. The Hiroshima City Sightseeing Loop Bus Meipuru-pu is a bus that travels on a circular route through Hiroshima and stops at tourist spots and art galleries throughout the city. This bus makes stops at Hiroshima Station and the Prefectural Museum of Art (Shukukeien Station), Hiroshima Castle (Morikuni Station), the Genbaku Dome, Peace Memorial Park, Kamiyacho and at Hacchobori. One ticket costs 200 yen for adults and 100 yen for children, while all day passes cost only 400 yen for adults and 200 yen for children. The Hiroshima Peace Pass (1 Day Bus and Train Pass) enables people to use all of the train lines and all of the city buses to their heart's content within Hiroshima. It costs 700 yen for adults and 350 yen for children, and is very convenient for seeing the city sights and exploring in Hiroshima. Miyajima island, home to the World Heritage Site, Itsukushima Shrine, is also found in Hiroshima prefecture. Though a striking contrast is made during high tide between the shrine and the great torii standing in the water, at low tide it is possible to walk from the shore to the torii and see its impressive size up close. The illuminations at night here make for a truly mystical scene as well. To reach Miyajima from Hiroshima Station, take either the JR line (about 25 minutes) or the streetcar (about an hour) and alight at JR Miyajimaguchi Station (JR宮島口駅) or Hiroshima Dentetsu Miyajima Station (広島電鉄宮島駅) respectively. From here you will need to hop on the ferry, which will arrive at Miyajima after about a 10 minute ride. From: Souvenirs From Hiroshima – 6 Delicious Sweets That Make Great Gifts! 2 of the most famous souvenirs from Hiroshima are their momiji manju and their castella sponge cakes filled with anko. Other notable treats are the delicious Hattendo cream bun with its rich and fluffy whipped cream, and the authentically flavored Hiroshima-style Okonomiyaki Senbei (rice cracker) made by the Tanimoto Food Industry, and many, many others. After spending a memorable trip in Hiroshima, make sure to pick up a souvenir to remember your trip by!